There are three small steps that will lead to giving you the best chance of your target audience watching and engaging with your videos. 1. Make a (custom) thumbnail for every video you release. Every platform where you upload your videos (Wistia, YouTube, Instagram, Facebook) allows you to also upload a custom thumbnail. The simplest way is to export a still frame from the video itself. A close-up of a person’s face is a great choice; our attention as humans is consistently drawn to looking at other people’s faces. 2. Embed your videos on your website. This may seem obvious, but you’d be surprised how many businesses I’ve seen who only upload a video to YouTube and then seem to just hope that their audience finds it. What really matters is to embed your videos on key pages and posts of your website. Embed your videos on your website so either you may lead your audience directly to them (like: through your email newsletter), or they may discover them on their own (like: through the navigation on your site). 3. Write a title (or headline) for the video that’s relevant to your viewer’s interest. Aim to create curiosity or to answer a specific question for your viewer. The key is to make it relevant to your viewer, first. 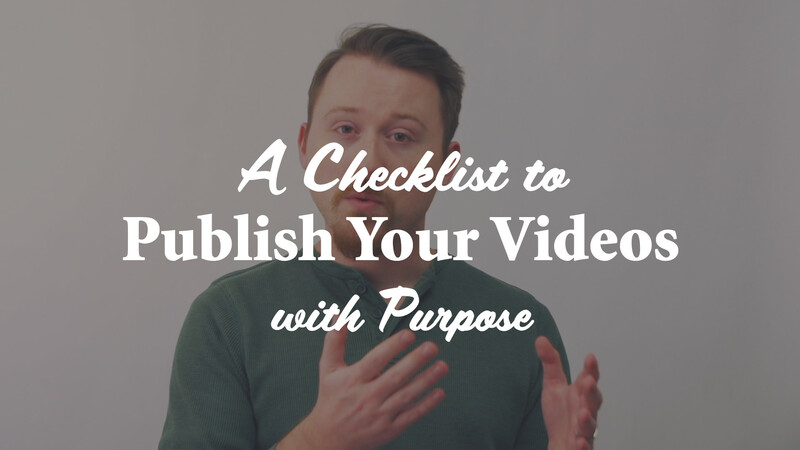 Why use this checklist before you publish your videos? These three simple steps – custom thumbnails, embedding on our websites and writing (relevant) titles – all lead to giving you a chance to maximize the “click-ability” of your videos and increase the likelihood that your target audience will watch and engage. Where do you publish and share your videos online? Any tips to share? Consider sharing in the comments below.